The Fly Fisher’s Flower . . .
My interest in wildflowers grew like a branch off my main outdoor recreation of fly fishing. This outdoor sport projects a person into the spaces where wild things are and, over time, even the most focused angler becomes aware of more than the fish and act of fishing. There is the bird life that sings and sometimes indicates where the fish might be holding, the insects that the fly fisher imitates with hook-bound feather, fur, and thread, the trees that give voice to passing breezes, and then there are the patches of color that punctuate the bucolic scene: the wildflowers. Trout season in most American states begins traditionally at the start of April just as the first plants are beginning to bloom. An evolving series of new and different flowering species will add their own color along streams and around ponds throughout the forward course of the fishing season. These provide the fly fisher with more than beauty. Taking a cue from Phenology, the branch of science that connects climate with periodic biological life cycle phenomena, the predominant flower of the moment provides the hatch matcher important clues about which insects are active – or “hatching” – and they therefore choose to tie and fish their fly patterns accordingly. Of all the plants fly fishers encounter out in the field, the marsh marigold (Caltha pulustris) is the most iconic. This is the angler’s first flower, the one encountered at the start of trout season. Known also as “cowslip” and “buttercup” in the vernacular, this species is a native plant with its own identity. 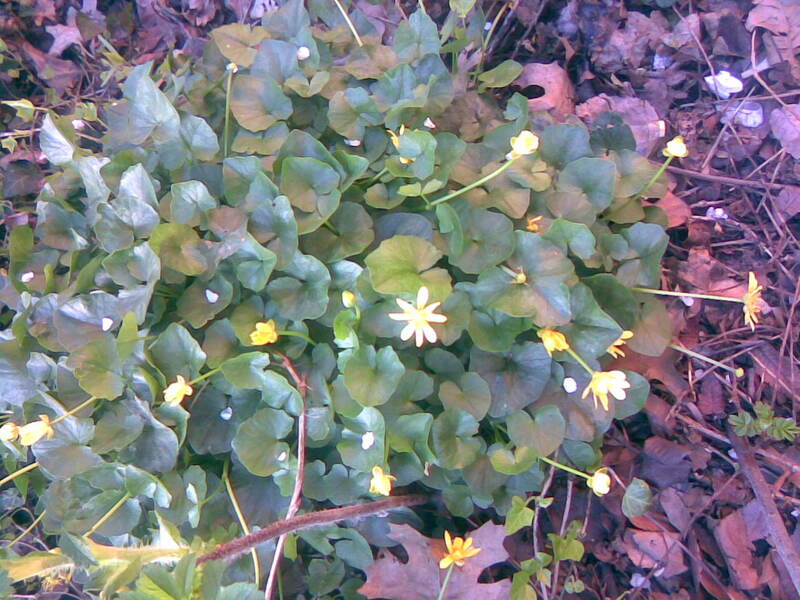 The marsh marigold pushes through the leaf litter as early as March, grows in thick bunches of vigorous, heart-shaped leaves. The bright yellow blooms, which are actually the plant’s sepals, appear quickly thereafter and have the ability to carpet brookside glades with a mellow gold that glows even on cloudy days. One can easily differentiate the marsh marigold from the true cowslip (Primula veris), which is found in Europe, and the buttercup, which may be any one of a number of immigrant varieties of the genus Ranunculus. The European cowslip grows from a rosette base of radial leaves that supports a stem that holds clusters of small, yellow, bell-shaped flowers. The Ranunculus, especially the common creeping buttercup (Ranunculus repens), bears a similar bloom to the marsh marigold, but possess a very different leaf pattern, one that is deeply lobed and veined. I was not sure I would get to see my favorite fishing season flower this year. There are no trout streams flowing through Manhattan, nor are there any parks in the West Village that contain wild, untended woodlot wetlands. My wife and I travelled to her family’s southeastern Pennsylvania home for the holidays, so we squeezed in the Monday after Easter weekend and spent that morning wading and fly casting along a little freestone stream that flows within walking distance of her parents’ home. There we watched a pair of kingfishers, always a good omen for the angler, circle around in a call and response mating dance. 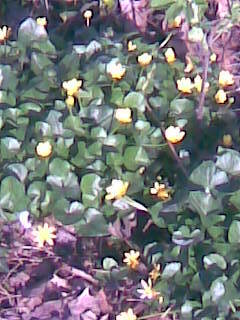 I was delighted also to find the creek’s surrounding woods carpeted with thousands of Caltha pulustris blooming like little suns. Bathed in morning light, covered in dew, poised at the peak of their collective display, these marsh marigolds allowed me to see with my own eyes how the phrase “dripping with color” came to be coined. Back in Manhattan, I continued my morning walks around the West Village. The final stretch usually finds me, coffee-to-go in hand, strolling north along the promenade of Hudson River Park, or else on the opposite side, walking along the West Side Highway. Both vantage points provide a fine, wide-angle view of the Jersey City skyline that leads south toward the distant silhouettes of the Statue of Liberty and the twin suspension peaks of the Verrazano-Narrows Bridge. When I reach the front of Jane Street I stick to the right in the shadow of the buildings. The one situated on the northeast corner is of particular note. Red brick and limestone in construction, the facade boasts a prominent limestone cornerstone just above head level. The left edge facing the Hudson River reads “A.D.” and the right edge that faces south reads “1907” – This is the Jane Street Hotel, designed by William A. Boring, the architect of Ellis Island’s immigrant station. The hotel’s interior was designed with a nautical theme and, in 1912, accommodated survivors rescued from the doomed luxury liner, The Titanic. I imagine those folks – though happy to be alive and comfortably on land – may not have appreciated the décor quite so much, given their experience. Across from the hotel is a narrow green space that separates the busy highway from the quiet cul-de-sac that links the front of Jane and Horatio Streets. The day after I returned from the Pennsylvania holiday, I broke from my usual route for no other reason but a spontaneous change of pace and place. Instead of walking by the cornerstone of the Jane Street Hotel, I hung a left toward the green space. My decision, made practically on autopilot, rewarded me when I began to walk on the brickwork between the plantings. There, among the rose bushes, nestled within the leaf litter, was a scattered colony of marsh marigolds; my favorite spring wildflower, the fly fisher’s flower, growing and glowing in the shadow of the adjacent hotel. I had indeed discovered gold . . . Very nice, again. You’re helping me see Manhattan differently, and I’ve lived here for 30 years. I love old maps of Manhattan. They show that there were many streams here. In fact, Manetta Brook, still runs under lower Fifth Avenue.